Earn $5.39 in VIP credit (539 points)What's This? 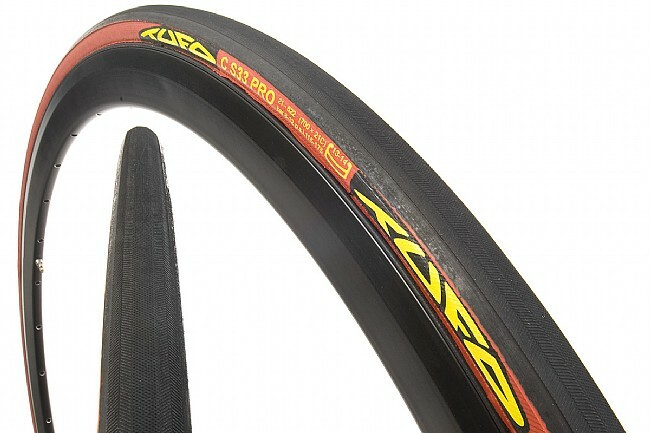 With the C S33 Pro Tubular-Clincher Tire and the other tires in Tufo's Tubular-Clincher line, Tufo brings the advantages of tubular tires to standard clincher wheels. Thanks to this innovative design, riders can embrace the speed and ride quality of a tubular tire with the hassle free installation of a clincher. The C S33 Pro is a great training tire in the Tubular Clincher line, offering many of Tufo's high end features at an affordable price. I have about 13k miles of riding on conventional Tufo tubular tires and I've been quite satisfied with their performance. So when I picked up clincher wheels for my new bike, I figured I'd try tubular clinchers. I like the convenience of putting some sealant in the tire and essentially never having to worry about flats. These have the added advantage of pretty easy, tool-less installation and no need for glue tape. I've tried both the 21mm and 24mm widths. As expected, the 21mm has a harsher ride. Both feel fast, but I haven't put in enough mileage to really judge. The 24mm is both wider and taller, as I discovered when I couldn't drop out my rear wheel unless I deflated the tire. I've seen a bunch of comments about the difficulty in mounting these tires. I believe there's a trick to it. I start by manually stretching the tires, probably for the placebo effect of an easier install. I suspect my effort is unnecessary. Insert the valve stem through the hole in the rim. Brace the rim against something to keep it from slipping (I use carpet) and lean into it as you evenly stretch the tire over the rim. Once you've got most of the tire seated, press your thumbs against the shoulder of the tire (the part that fits in the clincher part of the rim) causing the tread to rotate to face you. This should push the opposite shoulder up over the edge of the rim. Ease the tire over the edge until it finally flops into the rim bed. Check that the valve stem is straight. If not, try again. Inflate the tire to one bar at the most. Seat it with your thumbs per Tufos directions. If you over inflate it, this will be a strain on your thumbs. Less pressure and it's cake. Love these tires! Some have said difficult to mount, but Tufo directions are spot on, and I didnt find them difficult at all - much easier than regular tubulars. Roll smooth and fast, design allows you to run much lower pressure. I run 24mm at 75-80 psi for comfy, grippy ride. Filled with a 1.5 to 2 oz of Stans, these tires are also bombproof. Our roads in Balt-DC area are rough, and these have held up well over several hundred miles so far. Love them so much I bought a 2nd pair from BTD! 16 of 18 customers found this review helpful. I wanted tubular performance but only have 1 set of Tubular Carbon rims, but several aluminum rims. I mounted these Tufo S33's on my beloved Mavic Kyserium Elites, and am impressed at the solid ride & handling. It's firm, but not buzzy. (well, except on extremely rough pavement, true of any high pressure 700c road tire) And the 175 psi rating attests to it's toughness. I'm 195, and I've run em at 160 psi, and they are super efficient, just floating across the tarmac. I also run about 2 oz 60ml of Stans sealant in them as a flat preventative measure, and so far, no flats. I expect they will work similar to a Hutchinson Road Tubeless tire I tested last year (which sealed many small pinprick punctures, but had 'bead seating issues' that made me sour on them), but perhaps this arrangement is better as the sealant is totally contained within the tubeless casing, and this should (still testing to find out....) result in the sealant remaining liquid & effective for longer than the 3 months on the Hutchinson road tubeless. The only downside was it was initially a bit tough to mount. But I did manage to mount the 2nd tire in 13 the time, so that shows how it's just a bit of a 'learning process'. Once you get the hang of snapping the bead hook portion on the rim bead, no problem. One tip inflate the tire to 120 psi & let sit overnight, then deflate to 5-10 psi & mounting will be MUCH easier ! I do love the peace of mind of knowing flats are highly unlikely now. Just to be sure if I get a larger cut than the installed sealant can handle, I carry another 2 oz bottle of Stans sealant, super glue to heal the cut externally, a valve core wrench & an inflator. I learned of this method from some blog posts & this also can work or regular tubular tires, of course. I also appreciate the very high performance - I'd equate their road feel & efficiency to a Conti GP 4000 (my favorite clincher), but they seem to be even tougher constructed. Only in my first 1000 miles & no discernable wear yet. Bravo Tufo......I'm buying a set for my Daughter who races for Christmas. Thanks for the good deal BTD ! I have been riding Tufo tubular clinchers in various models for more than a decade. I'm guessing that I've covered somewhere between 80 to 100,000 miles on these over the years. Let's be honest ... these tires are pain to mount until you get a knack for it. But the pain gets easier with practice AND it's worth it. Every Tufo I've owned rides well and the mileage I get from them is far beyond any other tires I've used. I only buy this from BikeTiresDirect. The Tufos brand is good durable tyres for the money. I have ridden Tufo tubulars and this tubclincher tyre at 21mm in the past. Went to Gator Skins 25mm tubulars, Vittoria 25mm clinchers, and Michelin Litho 2 25mm two years ago - different bikes. My first ride impression on this Tufo tubclincher in 24mm was a very noticeable fast rolling tyre. I took it slow at first to make sure it was settled well to rim but after a few more miles. I was really rolling along smooth and fast. I can compare the ride feel to the glue on Gator Skins but the Tufos seems to be a little more firm - both brands at 100 & 110 psi. On my rims this tyre measures 25mm. With my first set of Tufo at 21mm a few years ago. I was forced off the road and hit a curb. The tyre pop but stayed on the rim. This tyre is not easy to mount and I can say gluing is faster and easier but its worth the effort once mounted. Great Value for the money, fast & smooth ride, but hard to mount. I suppose the tyre should be hard to mount so it is impossible to roll off. I do not think I will give up on glue-on for this type of tyre but may not go back to traditional clinchers. The most comfortable roade tires ever. Also i use stans in them. Wast sure how sealant would work in s high pressure tire, as i have had it not work in other toad tire set ups. Wasnt enough air volum to seal begor going flat. I got a frint puncture and after a few minutes of getting misted the tire sealed up, and i fidnt even need to stop to add air. They were easyer to install than most clinchers and especially easy compared to any tubles. Tufo will be my go to tire from now on. Their clinchers were my gateway drug to tying the tubular clinchers. I am going to get a tubular wheel set to trybtheir tape and tubulars next. I love the smooth ride of these tires. Overall performance is great. I have logged 1800 miles so far with zero issues. Plenty of life left, I expect to get around 3k miles before replacing. I have been carrying a bottle of Tufo extreme sealant in my saddle bag just in case but I have not needed it so far. I will be ordering more of these when needed. These tires perform well if you can get them installed. They simply won't mount on some rims. I tried installing a pair of the 21C Tufos on the narrow Mavic rims of the stock wheelset on a 1980's Peugeot Triathlon. I was able to mount one tire with considerable difficulty, but the other was absolutely impossible to mount despite more than an hour of effort that caused blisters on several fingers. I grudgingly accepted defeat and mounted them instead first on a wheelset with Mavic SUP rims and ultimately on a wheelset with Campagnolo Omega 19 rims, where they'll now stay 'til I wear them out. These tires can be mounted in minutes on rims that will readily take them, and when you get the knack of it they can be easier to install than regular clinchers. But on some rims be prepared for a battle. I'm running another pair of the 24C tires on Mavic MA40 rims. On that install too, one tire mounted easily, but the other one gave me a lot of trouble around the stem where you can't compress the tire well to work it down into the bead of the rim. I do like how they ride, can be inflated to very high pressure, and can be run with sealant to protect against flats. Their main drawback is uncertainty and variation in ability to mount them on some rims. I was biased against this type of tire based on comments I'd read in a few bike maintenance books. But, based on a sale price and generally good experience with other Tufo products, decided to give it a try. First... Yes, they can be very tough to install! I think the trick is to closely follow the instructions and start one side under the bead of the rim. I was trying to clip the first side right into the rim bead and just couldn't get it finished. And, yes, it helps to preinflate them the night before. The ride quality is really quite good for me. I train on mediocre quality rural asphalt. But, the few places where they've redone the blacktop, I can really feel these fly! That's something I hadn't noticed with Vittoria clinchers. Flats rarely pose a problem if you use a sealant (Stan's works for me.). All the Tufo tires I've tried have been quite repairable, with sealant andor cyanoacrylate glue. My worst experience was getting a fish hook in the tire. I almost pulled it out, remembered the barb on fish hooks, and so I just broke off the protruding bit. Funny thing, with the sealant I didn't even lose any air! But, when I got home and pushed the little bit of metal in, the tire went mostly flat. But, again, Stan's eventually kicked in. That was over a month ago. The tire is still going strong, albeit with the need to top off the air a bit more than usual. For the record, Tufo's are the only tubulars I've ridden, so my perspective may be a bit narrow. But, so far, I really like them much better than any clincher I've used. These replaced a well worn set of Conti Four Seasons. I was looking for a smoother, more supple tire. At first I was not too pleased, but now that I have about 400 miles on them, I like them much better. Subjectively, they are still quite firm, but smoother and more supple than the clinchers. Objectively, the speedo shows faster speeds on downhill coasts. Mounting When they are new and cold and the installer is old - it is hard. I left the second one in the sun on the patio until quite warm & it went better. Used a block of soft wood to rest the rim on with the outside hanging over so there was room to get the tire on when reaching the bottom, which helped. Pressure I've settled on 90psi for my 200lbs. Ride is much better and just as fast as with higher pressure. I'm coming around slowly to the fatter softer tire philosophy. Wear Not much sign of wear at 400 miles, looks like they will last decently. Since I ride in goathead country, I pre-charged with 2oz. sealant at mounting. When the inevitable puncture came, I was able to ride home 7 miles on a partially inflated tire without incident. All in all, I'm happy with the tires and would purchase them again. If you live in a state where the roads are poorly maintained you might want to consider getting tufo clinchers! They are the perfect solution for poorly funded transportation budgets and bike tires direct has them at great prices. My favorite tire - on alll my road bikes! I REALLY LOVE THESE TIRES ! They go on reasonably quickly with no tools. They last a LONG time, they can be ridden while flat and get yourself home ! These tires are very light and fast. If you like the feel of the road and nice handling, you will like these tires. I like the fact that if the tire goes flat that it protects the rim. Pin holes can be sealed with the sealant but if you get a decent size cut the tire is done. That is the only drawback of having a tire like this one. if you have road support then it isn't a problem (which most of us don't). A bear to mount but they ride great. I bought these on sale, but also because of the 24c width. I like 25c tires, but when I replaced my for with an Easton EC70, 25c tires rubbed. I road Continental Grand Prix 700 x 24 and they fit, so I decided to give these a try. I already had a fresh set of Hutchinson road tubeless on the bike so I mounted these on a spare wheel set to stretch them out. They are very difficult to mount. I used some talc to make mounting easier. When it came time to put them on the bike, mounting was easy. The ride is excellent. I run them at 90 PSI. I run the tires dry and carry sealant. I figure the sealant might set up in the tire and not work for me if I flat. The only real issue is the tire size. They rubbed (barely) on my fork. I measure the circumference at 2110 mm. My computer manual lists 2105 mm as the 25c tire size. To put the rear wheel on the bike I have to deflate the tire then pump it up after mounting. I had to do this for other 25c tires as well. My mechanic tweaked the dish of the wheel slightly to prevent rubbing on the fork. If your bike handles 25c tires without problems you can strike this paragraph. I would buy Tufos again but in 23c. Maybe it will be a 24) I'm sure each mounting will get easier. For my team I only use the Tufo tires I buy at biketiresdirect.com They are very durable, inflate to high pressure, and for the clinchers, do not force the sides of the wheel. Highly recommend. Better performance if used together with the Tufo sealant. 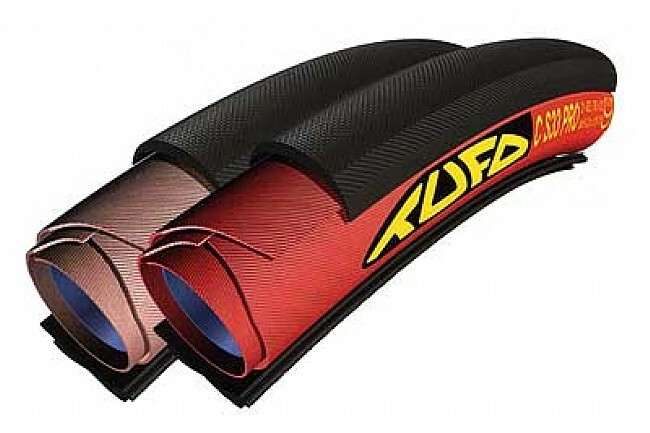 Tufo's are the best bicycle tire your money can buy ! If you have not tried Tufo tires before you will be blown away at the quality, weight specs,and free speed you will gain. I have raced on just about every wheel and tire combination out there. You can take your training wheel set and be the fastest person in the event. The install for the tubuler clincher is somewhat tricky and it helps to have a warm tire.Once on, they are true running and very smooth with a high PSI and low rolling resistance. Make no mistake, these are a challenge to mount. But worth it. I commute to my downtown office on a track style fixie (with brakes)and I fill these to 165 lbs. Initially, I thought the high pressure might be a bit much but these tires grab the pavement and won't let go. If I hit a pothole I'm not concerned with getting a pinch flat. They feel lighter than a standard tire and tube and make for a really fun commute. I have ridden Tufo tubular clinchers for at least 5 years. They are a perfect compromise between traditional tubulars and clinchers. I think they offer a superior ride to clinchers without the hassle of gluing tubulars to the rims. I use about an ounce of Stan's sealant in each tire and can't even guess how many flats that has prevented. Tufo does have a sealant but I have found it to be unreliable. It seems to become watery after a while and it will loose it's sealing ability. Stan's has been a good alternative. The only other thing to mention is it does take a little practice to get used to how to install a tire. With a bit of practice you will get the hang of it. The few times I do get flats I can be back riding in about 5 minutes with a spare. The key is to use a spare that you have ridden on and has already been stretched so it is an easier installation. I honestly don't understand why these tires are not more popular. Very high mileage tire. Very reliable, high performance.. Just like the S33. Ultimately, lighter than any of the other clinchers since you have neither tube nor rim strip. Prolly 120 gr. for those.